Accurate models for exterior convective heat transfer coefficients (CHTC) are important for predicting building energy demand. A detailed review of the literature indicates that existing CHTC models take into account the impact of building geometry either incompletely, or not at all. To the best of our knowledge, research on the impact of exterior CHTC models on the predicted energy performance of buildings with different geometry has not yet been performed. This paper, therefore, investigates the influence of CHTC models on the calculated energy demand of buildings with varying geometry. Building energy simulations are performed for three groups: buildings with Hb (building height) > Wb (building width), buildings with Hb < Wb and buildings with Hb = Wb. Six commonly used CHTC models and a new generalized CHTC model are considered. The generalized CHTC model is expressed as a function of Hb and Wb. 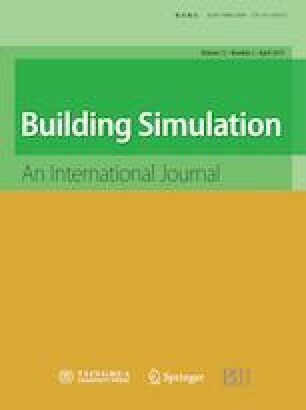 The simulations are performed for low and high thermal resistances of the building envelope. The results show that the different CHTC models provide significantly different predictions for the building energy demand. While for annual heating demand, deviations of −14.5% are found, for the annual cooling demand a maximum deviation of +42.0% is obtained, compared to the generalized CHTC model. This study underlines the need for the CHTC models to consider building geometry in their expressions, especially for high-rise buildings. For low-rise builgings, the observed deviations between the existing and the generalized CHTC model are less pronounced. The research is financially supported by the PhD Impulse Program of Eindhoven University of Technology in collaboration with the construction company Heijmans B.V., the Netherlands. The second author is currently a postdoctoral fellow of the Research Foundation - Flanders (FWO) and is grateful for its financial support (project FWO 12M5319N). To view a copy of this licence, visit http:// creativecommons.org/licenses/by/4.0/.